A mole is a type of pigmented birthmark. It may come as a surprise to learn that many different types of birthmarks exist. They can vary in everything from shape to color. Read on to learn more about how to distinguish one from another. Texture: Some birthmarks might be flat, while others might be slightly raised. Some have an irregular border, while others are perfectly symmetrical all the way around. Color: Besides its size, color is the most noteworthy trait of a birthmark. Shades can range from the darker end of the spectrum (including black, brown, blue or tan) to the lighter end (including red, purple or pink). In general, birthmarks are considered harmless. However, if they occur on certain parts of the body or experience changes in texture, they may eventually cause problems. In these cases, medical attention is always required. Macular stains: Macular stains are the most common type of vascular birthmark. They go by a variety of other, much more memorable names. When found on the eyelids or on the forehead, this flat, pale pink mark is known as an "angel's kiss". When they're located on the back of the neck, they're called "stork bites." They may also be referred to as salmon patches. In addition to the eyes and forehead, macular stains may also appear on the upper lip, nose and back of the head. Those found on the face tend to vanish by the age of two, while stork bites tend to remain on the skin well into adulthood. Note that these types of birthmarks are not considered harmless. Hemangiomas: Hemangiomas typically don't appear until several weeks after a baby's birth. They usually appear on the neck and head, but can really crop up anywhere on the body. There are two different types of hemangiomas: strawberry and cavernous. Strawberry birthmarks are bright red in color and slightly raised due to the presence of abnormal blood cells near the skin's surface. Cavernous birthmarks are blue due to the presence of abnormal blood cells deep below the skin's surface. Both types tend to grow at a fast rate during the first few months of a child's life; from there, they shrink and usually disappear in early childhood. Port wine stains: Often located on the face, arms, legs or neck, port wine stains are considerably more noticeable than other types of birthmarks. They range in color from purple to pink to red (hence their name), and actually grow in size as a person grows older. This can greatly impact an individual's self-confidence, particularly if the stain is especially prominent on the face. Port wine stains can darken in color over time, may become thicker and may even develop uneven, ridged or bumpy textures. Depending on their location, they may pose medical problems that require attention. Near the eyes, for example, they might impede vision by causing pressure on the area. Café-au-lait spots: Extremely common, café au lait spots are light brown in color and may be located anywhere on the body. They are not considered harmful, although an excess quantity of spots that are larger than quarter size should be checked by a doctor to rule out any potential nerve disorders. Mongolian spots: Common among individuals with darker skin, Mongolian spots are typically flat and blue to blue-gray in color. They are often located on the buttocks and lower back and tend to fade in early childhood. Moles: Moles are also extremely common, and just about everyone will have one at some point. They are typically black, brown or tan and may be flat or raised. 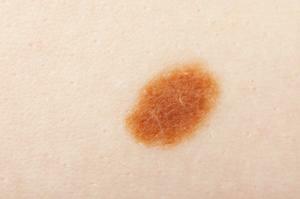 Changes in symmetry, size, shape and appearance should be noted, as these may be symptoms of skin cancer.